More than 295,000 Australians, including many from the Wimmera, served between March 1916 and November 1918 on the Western Front during World War One, of which 46,000 lost their lives and more than 130,000 were wounded. Originally excavated during the third century these caves have been used to shelter villagers from attacking armies during times of war over many centuries. During the First World War they were a popular place visited by soldiers on leave as this area was a busy staging area for Allied armies fighting in the Somme battlefields. Whilst there, many soldiers scrawled graffiti on the wall of the caves, recording information such as their names, dates, battalion number and home town back in Australia. Over 2,000 examples of graffiti dating from World War One have been discovered and a team of French and Australian researchers has been working together studying these writings and have identified inscriptions of at least 731 Anzac soldiers. For many of these soldiers this was one of their last periods of recreation before going into battle from which many would not return, although some were fortunate enough to survive the War and return home to Australia. One of these lucky few included Tarranyurk farmer, Laurence Binns who visited the Naours caves on 16 May 1917, after the 22nd Battalion of which he was a part had been involved in the battle of Bullecourt. 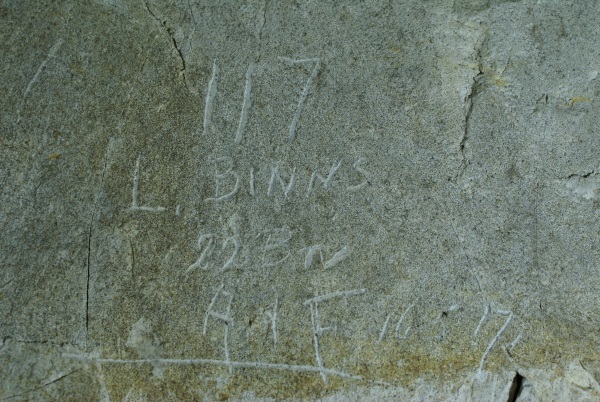 French archaeologist Gilles Prilaux has provided the above photo of Binns� inscription that was made over one hundred years ago, which reads 117, L Binns, 22 BN, A.I.F. 16-5-17. Laurence Binns enlisted on 30 January 1915, prior to his nineteenth birthday, and was allocated the regimental number 117 when he joined the 22nd Battalion of the Australian Imperial Force (AIF). After enlisting with his good friend Williams Buckley and a brief period of training in Melbourne, they departed Australia for the Middle East on board the troopship Ulysses in May of that year, after being farewelled at a gathering at Tarranyurk which was attended by over 100 friends and family. After further training in Egypt, the 22nd Battalion landed at Gallipoli on 8 September 1915, and remained there until they were evacuated on 19 and 20 December 1915, with Binns� only �respite� being a brief stint in hospital in early November. This Battalion was then transferred to France and the Western Front, where Binns was wounded in action on the 27th July 1916 during fighting at Pozieres. He re-joined his battalion from hospital a month later. An injury to his knee saw him transferred to hospital in England on 27 November 1916 and he did not return to France until early May 1917. During 1918 the battalion would be involved in many of the significant battles in the final months of the War. Corporal Laurence Binns (pictured centre above ) was awarded the Military Medal for his gallantry during the 22nd Battalion�s involvement in the defensive operations against the German Spring Offensive in 1918, at La Basse Ville in Flanders. His was one of four Military Medals and one Military Cross awarded to members of this Battalion for deed during this battle. For conspicuous gallantry and devotion to duty at La Basse Ville on the night 25th/26th March 1918 when the member of a fighting patrol. His Officer had gone ahead with a Sergeant to reconnoitre and came into contact with a force of the enemy. Observing his officer in difficulties this N.C.O. rushed up with his Lewis Gun and brought it into action causing the enemy casualties. He then kept his gun firing on the enemy post and prevented any further movement. Although in an exposed position and under heavy Machine Gun fire he remained there and kept his gun in action until the withdrawal of the patrol was satisfactorily completed. His courage and initiative proved of the utmost value at a critical period and his dashing example had a marked effect on the other members of the patrol. A bar was added to his Military Medal two months later, for bravery during the fighting and �peaceful penetration� operations around Morlancourt in the late spring and early summer of 1918, particularly in the attack at Ville-sur-Ancre on the 19th May. For conspicuous gallantry and devotion to duty during the attack on Ville-sur-Ancre near Albert on the morning of 19th May, 1918. This N.C.O. throughout the whole of the operation displayed great personal bravery and a disregard of danger which was very inspiring. During one portion of the attack the left Platoon of his Company was held up, and the flank of the Company on his right was left in the air. Under a very heavy fire he dashed forward with his Lewis Gun, and the fire he was able to bring single-handed on to the enemy positions was so accurate and well directed that it silenced the two Machine Guns which were holding up the attack, and allowed the flank which had been stopped to proceed. His work in covering the consolidation of his platoon was characterised by remarkable skill in handling his gun and calculating coolness, and greatly increased the confidence of his men. Only 32 members of the 22nd Battalion received multiple awards for gallantry during this war. 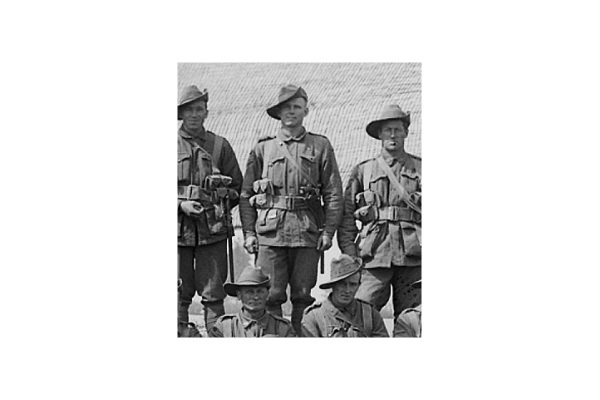 The last day the 22 Battalion was on the firing line at Montbrehain was 5 October 1918, and due to a delay in their arrival of their relief, it was not until the early hours of 6 October meant that they left the lines, making the 22nd Battalion one of the last Australian infantry battalions to be in the front line in France.  By this time all Australian battalions had been removed from the direct fighting to re-group, and they were still preparing to return to the battle when the Armistice was signed on 11 November. At the end of the War Binns held the rank of Lieutenant. Upon his return to Australia in June 1919, Binns resumed his life in the Tarranyurk/Antwerp area when amongst other achievements he was a keen sportsman; he was the Antwerp Cricket Club�s leading bowler between the Wars and one of the clubs highest scoring batsmen, and he featured in a number of football premierships with the Tarranyurk and Antwerp clubs. Between the Wars he also served with the 26th Machine Gun Regiment in the Citizen Military Force, also known as the Militia. In July 1940 Binns was seconded to service in the 3rd Motor Brigade of the 2nd Cavalry Division and at the time of his discharge in October 1942 he had risen to the rank of Major. 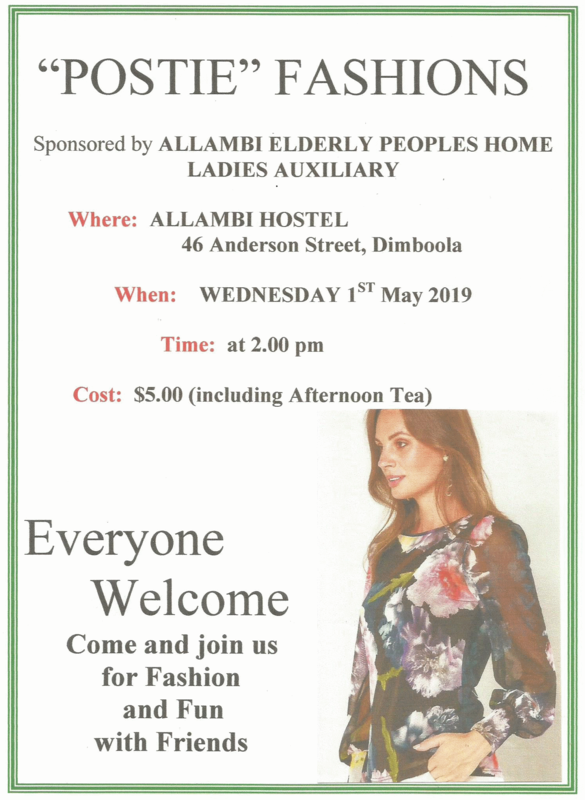 Once again he returned to the Wimmera after he had completed his service and lived in the area until he passed away at the age of 87 in September 1982. He is buried in the Jeparit cemetery, and his grave features a plaque marking his military service, as do many of the graves of former service personnel.